I worked a few more times on the watercolor and feel that it is basically finished. The computer has been down the last few days and in the shop so I couldn’t post a picture until today. Pictures taken and no place to unload them. I pretty much like the way the fruits have turned out, but the strawberry leaves are not quite what I hoped they’d be. I think perhaps I may have to do a few leaf studies just to work out how I want to do it with the watercolors. I like the textures of the raspberries and the strawberries that I achieved without the used of the pen. The sheen on the pomegranate turned out okay too. I just seem to get lost in giving the leaves enough definition, so perhaps it is time to just work on that. My fingers are itching to use the ink on them, but I don’t think it would fit in with the rest of the painting and I don’t want to ink up the fruit. I’ll probably get some of my house plants and use a few of their leaves since spring has not quite sprung yet, despite what the thermometer says today. 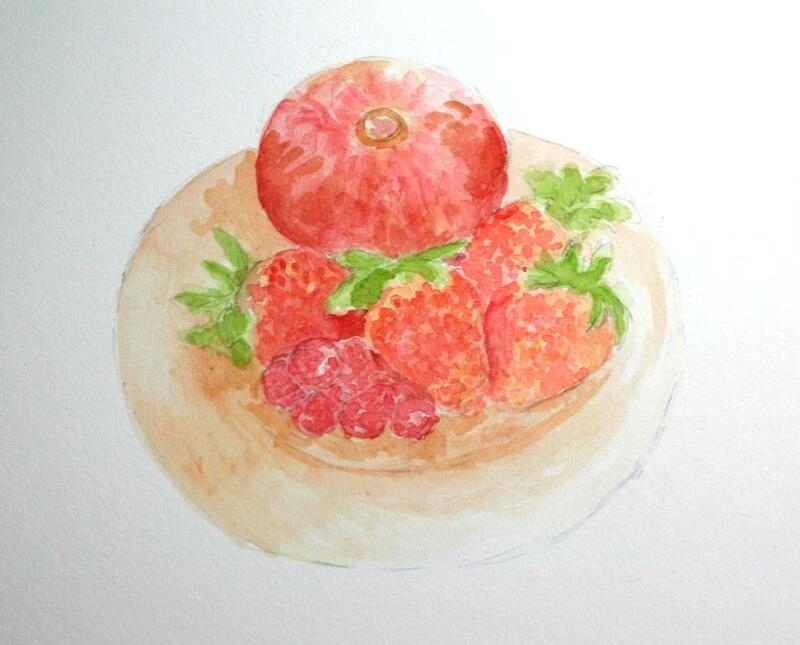 I bought some fruit for my weekend guests and after everyone was gone, I thought it might be fun to have a red fruit medley watercolor. 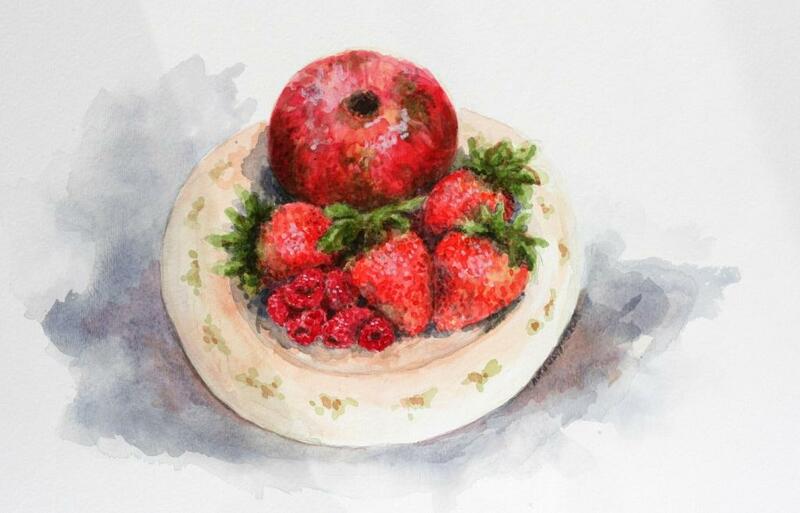 I had a late season pomegranate, some fresh strawberries and a package of red raspberries, which I thought would make a lovely painting. And while they are all reds, when put together, it is quite apparent that they are different shades and hues. This is really only the base but I had to stop as the board was getting saturated and the colors flowing together more than I wanted. I am leaving it overnight to completely dry. Even when I use a hair dryer on the lowest setting sometimes it won’t be as dry as I want and I don’t really think cooking the paint is a good idea. It is still rather undefined and I will only be able to judge it when I put in more detail and shadows. So far I like the mix of the reds. The raspberries and the pomegranate are closer to being true reds with a little blue thrown in (mauve?) while the strawberries have more of an orange cast. It will be fun experimenting with layering the colors on tomorrow. And then I get to eat the still life! I thought a short update on the stained glass that our kids are making for above our door was in order. After many hours of work, the soldering is done, the patina applied and the polish wiped off. Due to circumstances beyond our control, we were not yet able to get it into place this weekend as we had planned, but soon….soon it will be there. In any case, a brief peek at the current state of affairs seems to be in order. The colors have popped with the addition of the solder and I can finally see what it is going to look like (almost) when it is up. The heron will watch over us, I think, for many years. It is a wonderful gift from our kids and a beautiful addition to our foyer. I decided I needed to try the water spritzed ink technique with another architectural. I was not really satisfied with the way the watercolor/ink house turned out both in terms of the color and in the graying bleed across the image lines. I wanted to see if I could limit the overflow of the ink across the edges with the frisket so I kept it on the small side. The composition leaves something to be desired, but I was most interested in seeing how the frisket would perform so I didn’t pay as much attention to that as I probably should have. The frisket seems to have worked as I hoped, keeping the spritzed ink from seeping outside the drawing lines. However, I am not sure that I like the way that the ink is grayed out. It does seem to affect the pastel put over the top but not quite as much as with the watercolors. The gray undertones mean that I can’t blend quite as much as I would like and I have to leave a lot more pure color on top. I also have to redo a lot more of the ink with the nib pen. When I tried to use my technical pen to re-emphasize the black, the lines were too thin and didn’t seem to fit in well with the rest of the foliage area. I had to go back to the nib pen with its inherent risk of blotches and constant reload. I’m going to try another pastel, paying a little more attention to composition this time. I think I will still keep it on the small side because of the frisket application issue, but maybe I’ll use the nib pen on the exterior finishes too. I am sure that the constant pen reload will drive me crazy but I think that I need to try various combinations. I don’t really like the mix of the nib and the technical pen here and it will be interesting to see an architectural done solely with the nib. I haven’t done that in a very long time. Her stall may be empty but my heart is full. When someone loses a beloved horse it is common to take a lock of mane or tail as a keepsake and I was no different. But I wanted something more than an envelope in a drawer that a relative would toss away after I myself was gone. I met a wonderful artist on etsy (http://www.etsy.com/shop/bazketmakr) where I sell my pen and ink artwork who makes beautiful things, large and small, from a horse’s tail hair. I commissioned her to make something for me using Lady’s tail hair and the result is this exquisite basket. I must admit my heart skipped a beat when I first saw it. Since Lady’s passing, I have tried to jot down a few memories I hold dear to myself and will recall whenever I look at this in its prominent place of honor in my home. She loved her fresh carrots and treats from the co-0p, but surprisingly she despised sugar cubes. The only person she ever deigned to take sugar from was my friend Lynne, and I think she ate them only out of politeness because she loved her. Even with me, Lady would spit them out, sending them rolling away down the aisle with a look of disgust as if to tell me I should know better. She always took her treats with the greatest of care, lipping them gently from my hand, like royalty accepting her due so there was no need for haste. She was sorely disappointed if I ever failed to bring something but then graciously forgot about it as we went to work. I like to think I gave the freedom to have opinions back to her. When I first got her, she willingly did all that was asked. She was a hard worker but with a certain reserve that few besides myself were aware of. What was visible was an ordinary, steady, chestnut quarter horse mare, doing the best she could at whatever might be asked for. The first hint that there could be more behind it all came with the whip. A dressage whip is properly used only as a gentle aid, never as punishment. When I would tap, tap, tap on her side to help in a movement, I could tell she was insulted. She knew she had done nothing wrong and so she let me know – very politely of course – that the whip was uncalled for. It took a while, but gradually she grew to understand that between us the whip would be an aid and nothing more; that it was alright for her to question me about what we were doing and have a few ideas for herself about how things could go. After a brief period of opinions in spades we settled down to enjoying the path of dressage, quarter horse style, and it added immeasurably to the pleasure we found in each other. When she got the space to be herself, she proved to be a generous, funny companion who liked to make me laugh. She was a giving, intelligent partner in any task at hand. I could tell she loved movements that played to her quarter horse heritage, especially haunches in, renvers, and sudden changes in direction; anything that might swing her haunches and mimic working the cattle. The short legs and long back of the show type quarter horse limited us somewhat but she was always game to try anything and as she aged I had to be the one to stay sensible. Along the way we learned to do flying changes, extended trots, pirouettes, and some piaffe and passage together, all in the spirit of pleasure and accomplishment. Our inadvertant airs above the ground came about when, released from the collected effort of a piaffe, we launched skyward in a surprising version of the capriole. She was usually unflappable, but never dull – a great quality in a first horse for anyone. Her inner delicacy, hidden in a chunky quarter horse body, taught me true lightness. We sometimes saw deer on our outside jaunts but she never spooked at them, just stared intently to let me know they were there. A few times a rabbit ran between her legs and all she did was hop about 1″ straight up in the air before watching it scurry on its way. I always startled way more than she did. If she ever started to have a case of the heebie-jeebies I knew it was temporary and most likely due to a desire to get her blood going, like a child who enjoys the sudden scare but is not really worried overall. Before I would start grooming and massaging her, especially in her later years, she would quiver just a little in anticipation at the pleasures to come. She loved belly scratches in the summer when the small flies would cause intense itching around her naval. At times I was afraid she would fall over from the sheer ecstasy of it all. I learned to give her massages in her old age and how to tell what muscles were giving her particular trouble. I could help loosen those areas not used much anymore and ones stressed by her three bad legs. Who knew that gentle pulling of her tail to each side would end up being one of her favorite things. I had to be careful not to let go too quickly because sometimes she was stretching so hard against me that she could fall over unless I let her rebalance herself first. Thinking back over it all, I believe we took each other to places we never would have gone separately in a special partnership that is often only dreamed about. I am quite sure that although there may be others, there will never be one quite like Lady for me. That’s okay because no one should live in the shadow of some other’s past. The day before she died, Lady passaged lightly on the lead rope as we walked from the pasture to the barn – as she hadn’t done in years, reminding me of past glories that I didn’t know were ending soon. It was a little gift of laughter passed between the two of us which I appreciated at the time, if not its finality. 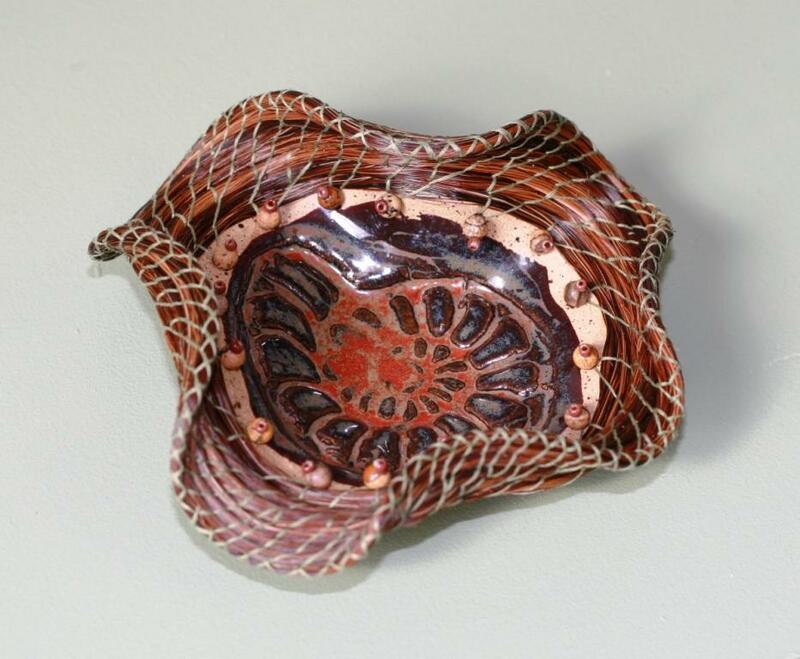 A last gesture of generosity from a gentle soul that goes into the memory basket. I wanted a small project to work on last week because I was having super bowl company for the weekend, so I pulled out a few animal reference photos and selected these two. When I started the polar bear I forgot to put on the frisket so he is a little texturally different than the others. It turned out okay but doing this made me realize that I like the effect that the frisket gives. I did apply it before I put on the watercolor, but it does seem to make a difference to use it with the prior penwork. 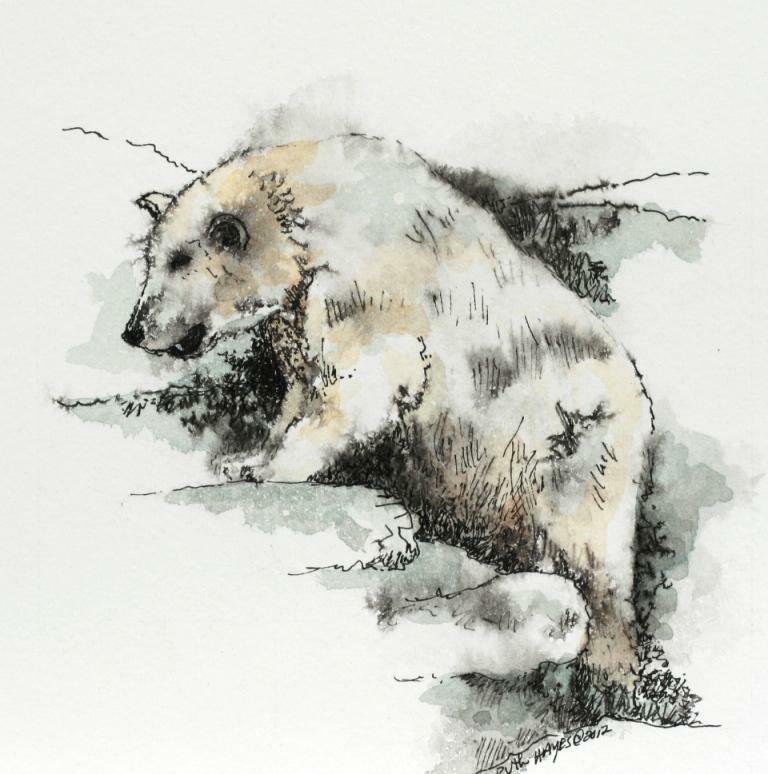 I went back and added some more ink to improve the black/white balance around the bear. I don’t particularily like the heads on either one of these, but the squirrel’s head seems a little bit more off to me. When I look at it, it seems too small. 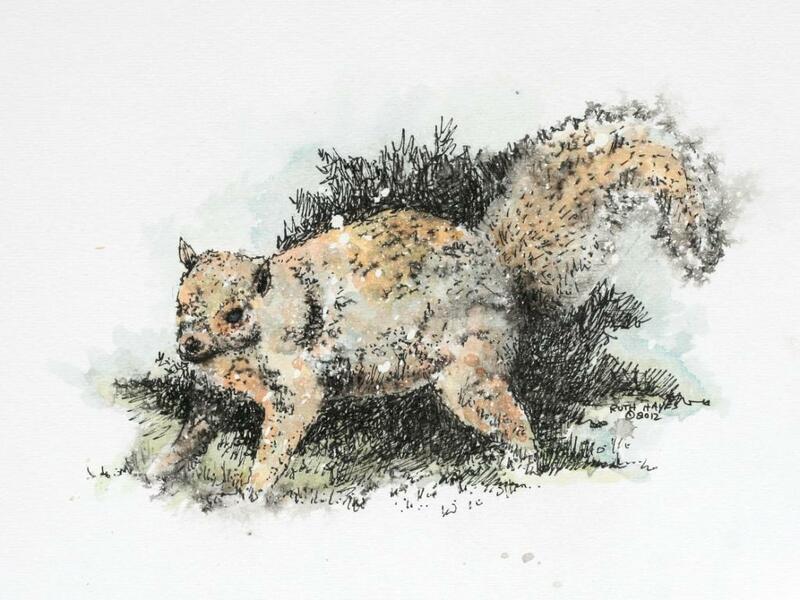 Afterwards, I went and added in some more background and fur ink to the squirrel too. Even though the weather has been pretty nice lately, I managed to get into the studio and color the entryway. this one is a little plainer overall then most of the previous ones, but I thought that it was distinctive enough to draw. 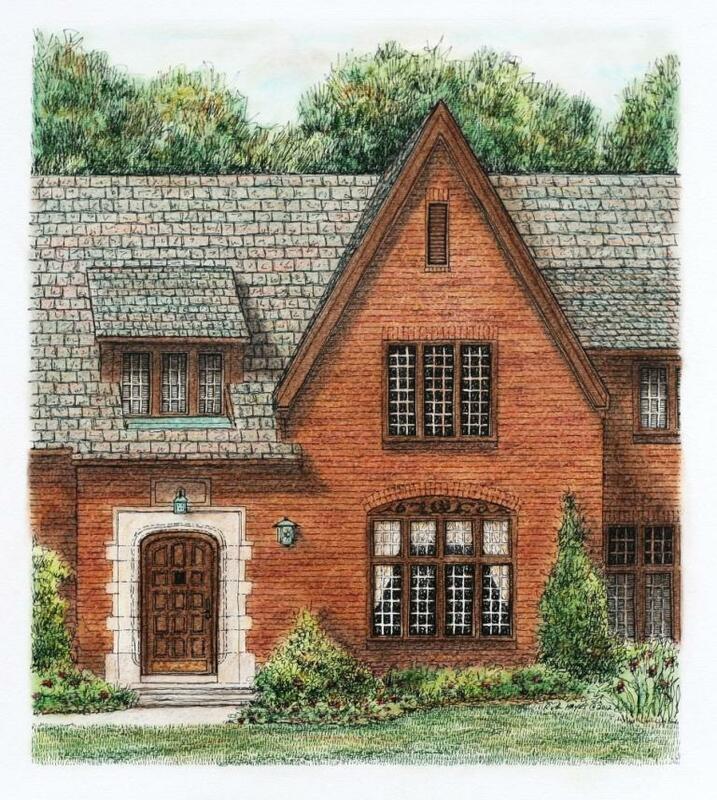 I couldn’t figure out a crop to emphasize the doorway more, so I ended up including the whole gable. 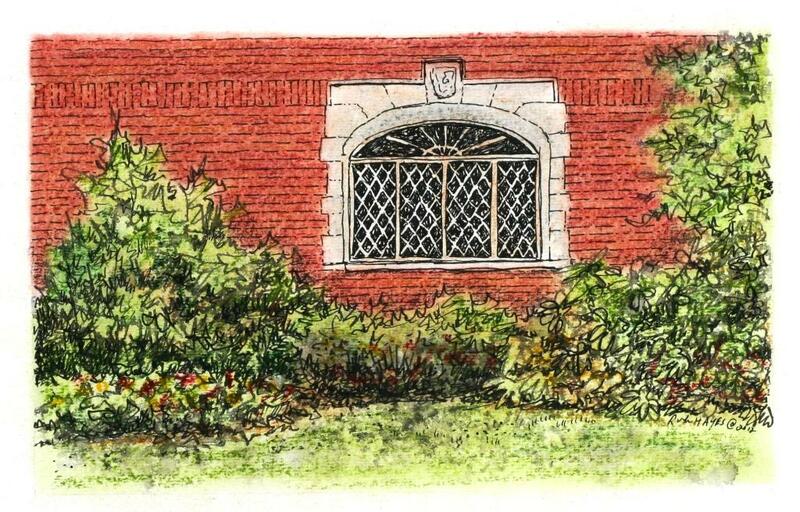 There is a nice limestone surround framing the doorway and a lovely quad window set with transoms in the front. Above those windows there is a carved wooden arch with flowing embellishments. This one has a little bit browner brick than some of the previous ones and the lovely slate roof typical of the area. I love the little shed dormer above the door. It makes me wonder whether it goes into a little attic room or if the foyer has a raised ceiling. I would guess a room as I don’t think high ceilings in a foyer became fashionable until later. Don’t know for sure though. This particular house had minimal landscaping so I made up my own. I never can understand when a grand house like this doesn’t have landscaping to complement and accentuate its architectural features. Maybe it was in transition but there just didn’t seem like much going on or planned so I helped it along.